Minimum System Requirements: Windows PC, that's the only thing I'm sure about, but OpenGL 2.1 should be supported as the whole thing is GL shader based. Plenty of graphics memory is helpful, too. I'd imagine Intel onboard gfx cards on laptops might not work. I recommend Nvidia or Ati no older than 4 years, as dumb as I might sound saying that. Let me know, if you have any troubles, please! It's recommendable to install Drivers | Wacom, even if you only use a mouse. If the color picker or any of the interface does not show, we're in trouble. Ati may have a bit of a different look (sloppy mess)... ...machines older than 2009 will have all sorts of troubles. FINALLY with Version 0.8 there is an interface, while some functions are still hidden and only reachable through HotKeys. Ideally you are using a tablet, of course, but even with a mouse it works quite well. Presently there's no real interface aside from the most relevant info in text and a color pallet. Thus be prepared to keep your hands on the keyboard! I wanted to make the interface as little distracting as possible so I opted against a clutter of icons and labels. Instead each major portion of the interface has one location that displays the currently important information. It's probably quite unusual and I don't know how well it will be received, but I- obviously- like it. Dials drag up or right to increase and left or down to decrease the values! Hold [Ctrl] while dragging to fine-tune the values! Toggles I shouldn't have to explain! Layers have only one less obvious feature and that is Delete. Select the layer you want to hide or show, hold and drag right to bring up the Delete Layer requester. The layer panel itself may come across a bit funny, because the dials you find at the top of the layer panel are always only for the currently selected layer! - merge layers Hold down [Ctrl] to change the "add above/below" button on the layerslide to "merge above/below". - copy layers Hold down [Shift] to change the "add above/below" button on the layerslide to "copy above/below". Fluidity - strength of fluid dynamics. They are always active, even at zero. Fluid Sharpness - reduction of blur of the vector field. At 100% the vector momentum is not spread at all, making the fluid motion as sharp as possible. Fluid Smudge - blending of colors along the fluid motion. At 100% the existing color dominates the moving color, making some very nice smudging possible. At 0% you can almost just deform your image. Drying Speed - controls the speed at which the paint dries...yep. But I might still adjust full tilt on drying speed as it currently makes little sense! Smudge Chroma - controls the color blending behavior of smudging (not average or opacity blending). 10% is default and ideal (IMHO), but you may turn it off or go crazy at 100%. This magical routine tries to preserve the color saturation as it blends from one color into another in a very special way. I'm almost certain you've never seen anything quite like it! Blending - turns on and controls the amount of "color averaging" under your brush. This works beautifully together with smudging, as it blends into the stroke the existing colors on the canvas. I like having about 30% of it up, but it does slow down the machine a little bit. Build-up - controls the amount of material that gets transferred to the canvas as you paint. Similar to but independent from the opacity for color, this shows the mechanics of Verve, as paint medium (like the oil in oil paint, so to say) is independent from color (like color pigment density in the oil). Bonus side effect: If you turn this parameter down to 0%, it only colors existing material on the canvas, making the existing material effectively acting like a positive mask. BRI.SIZE - stands for Bristle Size and refers to the size of each individual bristle in brushes that have bristles. As I'm adding more complex brushes, I'm trying to keep those parameter sensible to the features of such new brushes, like Brush #8 (fractal turbulence brush). Here the bristle size controls the coverage amount of encountered opaque values in the fractal noise. Currently this value scales with the size of the brush. BRISTLES - stands for Bristle Count, controlling the amount of bristles in a bristled brush. Here, too, the implementation for complex brushes such as brush #8 tries to stay consistent in logic and thereby scales the fractal noise so that more opaque splotches will be painted within the brush size. Currently this value scales with the size of the brush. BIAS - is a "hidden" dial on the brush thumbnail. Drag it to adjust which bristles will be used of the brush. Most brushes respond to pen tilt, but many of you may not have that feature on your tablet. I hope you do, though, because it's quite powerful! The tiny little buttons all the way on the edge are for the brush selection: "Next" and "Previous" brush. [Shift]+[Tab] toggles brush cursor visibility! [Shift] + [F2] turns on Adjust Canvas Area. Hit [Shift]+[F2] again to confirm the changes! Hit [F2] alone to cancel the changes! - Grab the corners with [LMB] to adjust the crop area freely and [RMB] to keep proportions! - Grab the edges to just adjust the chosen edge! - Hold [Alt] to adjust crop area symmetrical around original canvas center! - Grab inside the crop area to move the whole crop area! [F3] toggles "fullscreen" which really is just a desktop sized window without borders, but hey... certainly covers the full screen. [F4] toggles border conditions for canvas display between "Clamp", "Repeat" and "Mirrored Repeat". Holding the Left Mouse Button (LMB) will let you paint on the canvas. Hold [Ctrl] to erase paint, which also moves the paint. Hold [Ctrl]+[Shift] to flatten the material gradually. [r] toggles brush blur/sharpen, blurring or sharpening everything beneath your brush as you make your strokes. Hold [Ctrl] to sharpen. I recommend turning opacity to 0% while doing that, though! [brackets] to adjust brush size like in Photoshop. Except this one doubles or halves the brush size with each respective key hit. [c] toggles the display of a local colorwheel on the canvas at the cursor position. You can grab and move it by the left upper edge outside the wheel (still have to add gfx for that). [Shift]+[c] brings up color swatches. - hold [Ctrl] and click on the existing swatch to save the current color into it. - hold [Ctrl] and hover next to an existing swatch, where a miniature swatch appears. Click with LMB on it to make a new swatch with the current color. - hold [Ctrl] and use RMB to remove an existing swatch. - the same concept works on the small buttons above the swatches, which are like folders for additional swatch stacks. LMB to add, RMB to remove. [cursor left/right] adjust fluidity. You can adjust that while you are painting, which can be good fun! [-] [=] adjust fluid sharpness. [_] [+] adjust fluid smudge. [cursor up/down] adjusts the bump height of the paint. This is per layer and will come in handy, once you get to know it! You can do an over all adjustment of all layers, relative to their settings by using [Ctrl]+[Shift] on the above three parameters. ... are the 8 different experimental brushes currently available. Brush  reacts to the tablet's pen rotation. [q] toggles mask painting. The mask currently just acts as a border condition for the fluids. You can still paint over the area. [Shift] + [q] sets current layer's alpha channel as mask for fluids. [Ctrl] + [w] toggles "image warp" mode. In this mode your brush warps image coordinates only. Undo only works outside of warp mode, switching between the image before and after the warp. Currently there's no undo within the warp mode, but that won't destroy your image! - Hold [Ctrl] during painting in warp mode to restore original image coordinates inside the brush radius! [Ctrl]+[Shift]+[w] will reapply the last used warp. This way you can apply the same warp to other layers or have some fun reapplying the same warp a few times, hehe. [Ctrl]+[p] toggles through canvas texture modes. 1.woven canvas 2.custom canvas (creates a canvas texture from the current layer's paint build-up) 3.turbulent papyrus ...then rotates back to 1. [Ctrl]+[d] makes whole canvas wet, if drying is turned on. [Shift]+[F5] commits mirror mode, burning it to the image. This way you can design symmetrical but then continue normally. 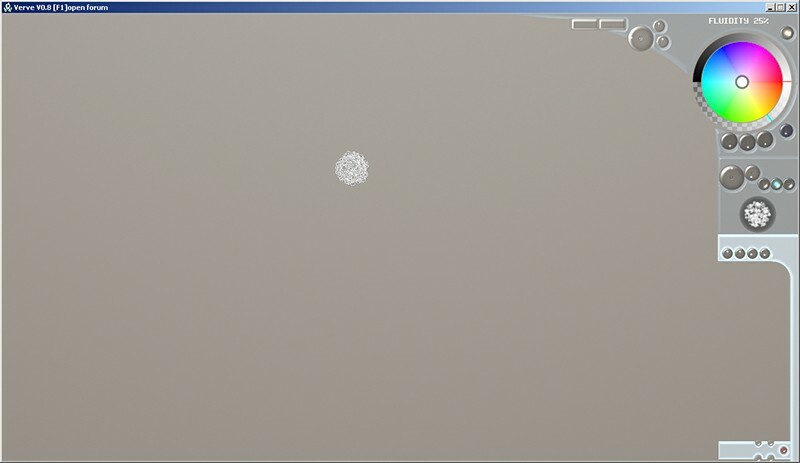 [Alt]+[Shift]+[Ctrl]+[RMB] reset rotatation of the canvas and stops "spinning", if active. [-] and [=] control canvas spinning speed. [Shift] + [Ctrl] + [f] to fill the current layer with the currently selected color at currently selected opactiy. This is a laboratory version, full of strange little experiments and interface stuff all over the place, but...heck...it's Christmas and there are plenty of gifts in it! (=) Absolute: In this mode your paint will not accumulate on the canvas, but only rise up to the chosen build-up amount. It's ideal for sketching. (>) Accumulative: This is the original paint mode, accumulating material on the canvas like it always did. It's ideal for painting. (+) Additive: This modes adds color values to existing color like adding light, in a way, eventually creating a glow. There is also a new parameter on top for an interactive glowing effect. It's fun. It's good for...ehm... fun. And all things light! Currently brush images are just experimental and work with brush #9 and #0. Brush images are like animation frames. You can keep adding images and they will playback as you paint. There is no management for them, yet, but you can save and load your brush image sequences already! Please, be patient and careful when you operate the hotkeys, not because there's any problem with it, but because it's a little weird. There are no indicators for modes or any stuff that one should expect, yet, so it's all very, very "garage" or "laboratory"...but still enjoyable, hehe, you may see!? Brush #0 only works with images. If there is no image, it will not draw anything!!! The little brush interface dials will do very specific things to this brush. Go explore, hehe! I'll explain more later, I promise! Mask mode now actually masks the image. [q] toggles mask active status without changing the mask. [shift]+[q] picks up the current layer's paint as mask. [right click] ON THE CENTER to turn your Quad into a square. It will figure out the average size based on all edges, you will see! [right click] ON THE EDGE (not the corner) will freeze the frame so you can paint over it without worries. This is cool when you want to make an animation or animated brush progression. I have to make a little youtube video for that! [right click] ON THE EDGE again and you will unfreeze the Quad again. (pr) will use pen pressure to pick an image from your sequence, starting at the lowest on the left to the highest pressure for the last image. (rn) will use random images from your sequence. - keep the Selector Quad where it is for now! - hit [i] again, which will store the image! - hit [i] again to add a new image! - make some more dots around the center! - make some more dots and make the center of it a bit more dense! - add more and more stuff and keep doing that for a few images more! When you've had enough, make sure you're done with your images (Selector Quad is no longer visible) and then select Brush #9. This brush paints similar to Brush #1, not using bristles, but will use your images instead of a blob. It paints those in intervals as you make a paint stroke. The speed at which that happens is based on the little dial called "Bristles" right next to the preview image on the brush GUI. (Oh man, I just noticed that I might have changed labels without changing them back for the old brushes, haha, danged...laboratory version!!!). Next to it is a smaller dial called "Osc.Chaos". Up to 50% this will randomize the rotation of the images as you paint. However, go over 50% and it will begin to offset the images until some maximum spread (very chaotic!). Above the "Osc.Chaos" dial is the "Oscillator" dial, which will simply rotate the image clockwise above 50% and counter clockwise below 50%. Next to that is the "Bri.Size" dial, which really randomized the image size with each plot. Master these few parameters and you can achieve a pretty interesting variety of effects! Si le sélecteur de couleur ou des éléments de l'interface n'apparaissent pas, il y a un problème. Les cartes Ati peuvent donner un aspect un peu différent (désordre des éléments) ... ... les machines antérieures à 2009 auront toutes sortes de troubles. Idéalement, vous utilisez une tablette, bien sûr, mais même avec une souris, il fonctionne très bien. Actuellement, il n'y a pas de véritable interface juste de l'information pertinente sous forme de texte sur le côté et une palette de couleurs. Ainsi vous être prêts pour garder vos mains sur le clavier ! [c] Pour la palette locale à la position du curseur. [Maj] + [Ctrl] + [f​] pour remplir le calque courant avec la couleur actuellement sélectionnée de l'opactité actuellement sélectionnée. Je suis un peu contrarié à ce sujet, mais j'ai décidé de simplement poster mon ancienne mise à jour de Verve v0.99v.1. C'est tout à fait une version de laboratoire, pleines d'étranges petites expériences et l'interface avec des trucs un peu partout, mais ... diable ... c'est Noël et il y a beaucoup de cadeaux à l'intérieur! S'il vous plaît, soyez patient et prudent lorsque vous utilisez les touches de raccourci, pas parce qu'il n'y a aucun problème avec elles, mais parce qu'elles sont un peu bizarres. Il n'y a pas encore d'indicateurs pour les modes ou de substance comme l'on devrait s'y attendre, c'est donc très, "laboratoire" ... mais toujours agréable, héhé, vous pouvez voir !? ASTUCE: Peignez vos images dans du BLANC, parce que plus tard vousverrez la couleur que vous choisirez pour les teintes que l'image. Si vous prenez une image de brosse en noir, par exemple, la couleur ne changera jamais! ... Je vais voir si je peux apporter mon nouveau truc de fichier de sauvegarde dans cette version plus tard ce soir, si je trouve un moment, mais pour l'instant c'est ce à quoi je pense, à l'exception du nouveau format de la brosse, bien sûr . Essayez! Quand vousen avez eu assez, assurez-vous que vous avez terminé avec vos images (le Sélecteur Quad n'est plus visible), puis sélectionnez Brush # 9. Last edited by Pilou on Mon Mar 24, 2014 5:29 pm, edited 6 times in total. Requisiti minimi di sistema: PC Windows, che è l'unica cosa di cui sono sicuro, ma OpenGL 2.1 dovrebbe essere supportato come tutto quanto è GL Shader based. Anche abbondanza di memoria grafica è utile. Immaginano che Intel a bordo di schede gfx su computer portatili ,potrebbe non funzionare. Raccomando Nvidia o ATI di età non superiore a quattro anni. Fatemi sapere, se avete qualsiasi problema, per favore! Se il selettore colore o qualsiasi cosa l'interfaccia non mostra, siamo nei guai. Ati può avere un po 'di aspetto diverso (pasticcio sciatto) ...... le macchine più vecchie rispetto al 2009 avranno tutti i tipi di problemi. INFINE con la versione 0.8 vi è una interfaccia, mentre alcune funzioni sono ancora nascoste e raggiungibili solo attraverso hotkeys. Ideale se si utilizza un tablet, ovviamente, ma anche con un mouse funziona abbastanza bene. Attualmente non c'è una vera interfaccia ,a parte le più rilevanti informazioni in testo e una palette di colori. Quindi dovete essere pronti a tenere le mani sulla tastiera! Volevo fare l'interfaccia con la minima distrazione possibile, così ho optato contro un mucchio di icone ed etichette. Invece ogni parte importante dell'interfaccia ha una posizione che visualizza le informazioni attualmente importanti. E 'probabilmente abbastanza insolito e non so quanto bene sarà accolto, ma a me-ovviamente-piace. Dials: fanno falcate più grandi, se si trascinano in orizzontale e passaggi sottili nel trascinamento verticale. Toggles : Non dovrei spiegare! Layers : hanno una sola caratteristica meno evidente , che è Elimina. Selezionate il livello che si desidera nascondere o mostrare, tenete premuto e trascinate a destra per aprire il richiesto Elimina livello. Il pannello Layer si può notare un po 'strano, perché i quadranti che si trovano nella parte superiore del pannello di livello sono sempre solo per il livello selezionato! Ok, ci sono due meno evidenti caratteristiche di guida dal v0.98. Tenete premuto [Shift] o [Ctrl] per funzioni alternative di determinati pulsanti. "Aggiungere sopra / sotto" e lo trasforma in "Copia sopra / sotto" quando si tiene premuto [Shift] o "Unisci sopra / sotto" quando si tiene [Ctrl]. Fluidity - la forza della dinamica dei fluidi. Sono sempre attivi, anche a zero. Fluid Sharpness - riduzione della sfocatura del campo vettoriale. Al 100% il vettore momentum non è diffuso a tutto, rendendo il movimento fluido il più nitido possibile. Fluid Smudge - mescolanza di colori lungo il movimento fluido. Al 100% il colore esistente domina il colore in movimento, rendendo possibile alcune sbavature molto belle . Allo 0% si può quasi solo deformare l'immagine. Drying Speed - controlla la velocità con cui la vernice si asciuga ... sì. Ma potrei comunque regolare full tilt sulla velocità di asciugatura in quanto ha attualmente poco senso! Blending - si attiva e controlla la quantità di " color averaging " sotto il pennello . Questo funziona benissimo con le sbavature , siccome si fonde con la stesa dei colori esistenti sulla tela . Mi piace avere circa il 30 % di esso , ma fa rallentare un po’ la macchina . Build- up - controlla la quantità di materiale che viene trasferito sulla tela come si dipinge . Simile ma indipendente dalla opacità per il colore , questo dimostra la meccanica dei Verve , come mezzo di vernice ( come l'olio di pittura ad olio , per così dire ) è indipendente dal colore ( come la densità del pigmento di colore nell'olio ) . Effetto collaterale Bonus : Se si attiva questo parametro a 0 % , ma solo con i colori materiali esistenti sulla tela , rende il materiale esistente, in pratica , come una maschera in positivo . BRI.SIZE - acronimo di misure di setole e si riferisce alla dimensione di ogni singola setola di pennelli che hanno setole . Come sto aggiungendo pennelli più complessi , sto cercando di mantenere quei parametri sensibili alle caratteristiche di questi nuovi pennelli , come Brush # 8 (frattale pennello turbolenza ) . Qui la dimensione delle setole controlla la quantità di copertura dei valori opachi incontrati nel rumore frattale . Attualmente questo valore scala con la dimensione del pennello . BRISTLES - acronimo di Bristle Count , controlla la quantità di setole in un pennello a setole . Anche qui, l'applicazione per i pennelli complessi come brush # 8 cerca di rimanere coerente nella logica e quindi ridimensiona il rumore frattale in modo che le macchie più opache saranno dipinte all'interno della dimensione del pennello . Attualmente questo valore scala con la dimensione del pennello . BIAS - è un dial "nascosto " sulla miniatura pennello . Trascinare per regolare quali setole verrànno utilizzate dal pennello . La maggior parte dei pennelli rispondono alle pen tilt , ma molti di voi possono non avere questa funzione sul proprio tablet . Spero che tu possa farlo, però, perché è abbastanza potente ! I minuscoli bottoncini lungo tutto il percorso sul bordo sono per la selezione pennello: "Avanti" e "Precedente" Pennello. [Tab] attiva la visibilità "interfaccia"
Tenendo premuto il pulsante sinistro del mouse (LMB), vi permetterà di dipingere sulla tela. Tenere premuto [Ctrl] per cancellare la vernice, e muovere anche la vernice. Tenere premuto [Ctrl] + [Shift] per appiattire il materiale gradualmente. [r] alterna pennello sfocatura, sfocatura tutto sotto il pennello, come fate i vostri colpi. [parentesi] per regolare la dimensione del pennello come in Photoshop. Tranne se questo raddoppia o dimezza la dimensione del pennello con ogni rispettivo colpo chiave. [Spazio] + [LMB] + [Shift] o [Ctrl] + [RMB] + [Shift] per regolare dimensione minima pennello quando si utilizza tablet pressure [w] toggle. [cursore sinistra / destra] regolare la fluidità. È possibile regolare anche mentre si sta disegnando, che può essere divertente! [-] [=] Regolare la nitidezza fluido. [_] [+] Regolare sbavature fluido. [cursore su / giù] regola l'altezza dei rilievi della vernice. Questo è per strato e sarà utile, una volta che si arriva a saperlo! Potete fare uno su tutti adeguamento di tutti i livelli, relativi alle impostazioni utilizzando [Ctrl] + [Shift] sui tre parametri di cui sopra. ...  sono gli 8 diversi pennelli sperimentali attualmente disponibili. Brush  reagisce alla rotazione della penna della tavoletta. [q] alterna maschera pittura. La maschera attualmente si comporta proprio come una condizione di frontiera per i fluidi. È ancora possibile dipingere su tutta l'area. [Shift] + [q] imposta il canale alfa del livello corrente come maschera per i fluidi. [Shift] + [F5] commina modalità specchio, fondendo l’immagine. In questo modo è possibile progettare simmetricamente, ma poi continuare normalmente. Questo è tutto per ora, credo. Voor de laatste Verve update zie hierboven. Minimale systeemvereisten: Windows PC, zoveel is zeker. Ondersteuning van OpenGL 2.1, aangezien het allemaal op GL shader is gebaseerd. Een groot grafisch geheugen helpt ook. Met Intel onboard gfx kaarten kom je waarschijnlijk niet ver. Aan te raden zijn relatief nieuwe (+/-afgelopen 4 jaar) Nvidia of Ati kaarten. Mocht je tegen problemen aan lopen, van welke aard dan ook, laat het alsjeblieft weten! Als je de color picker (kleurenwiel) of een ander onderdeel van de interface niet kunt zien heb je een probleem. Het is bekend dat er met Ati kaarten een ietwat verwrongen interface kan optreden (slordig zooitje)... ... Ook met computers ouder dan 2009 willen er nogal eens problemen optreden. Sinds versie 0.8 is er EINDELIJK een interface, sommige van de functies blijven echter slechts te bereiken per Sneltoets. Verve (Als je er een woordenboek op naslaat zijn geestdrift, bezieling, dichtvuur, verbeeldingsgloed en bezielende kracht termen die boven komen...) is het resultaat van een curieus idee dat ik (Taron) kreeg tijdens de poging met inzet van grafisch geheugen een simulatie met vloeistof dynamiek te realiseren. En afgezien van wat kleine onregelmatigheden --bij extra snelle bewegingen– bleek dat allemaal verbazingwekkend goed te werken, zelfs bij hoge resoluties. Dit maakte het mogelijk om zeer gedetailleerde simulaties te runnen van vloeistoffen met diverse kwaliteiten. Zodoende dat het geheel schreeuwde te worden ingezet voor schilderen. Wat je hier nu aantreft is een vroege versie van Verve. Maar 't schept momenteel al ongekende mogelijkheden in het domein van schilderen. In elk geval: 't is niet als iets dat ik ooit eerder ben tegengekomen. Ik hoop dan ook dat je er, net als ik, veel plezier van zult ondervinden. Zowel van wat het nu is, als van wat er nog komen gaat. Ideaal gesproken gebruik je Verve met een tablet, natuurlijk. Maar ook met gebruik van de muis werkt alles behoorlijk prima. De grafische interface wordt steeds uitgebreider maar is niet allesomvattend: dus wees voorbereid een hand op je toetsenbord te hebben. De inzet is de grafische interface zo min mogelijk af te laten leiden. Dus geen veelheid aan icoontjes en labeltjes. In plaats daarvan is er één plek waar informatie wordt weergegeven met betrekking op ieder los onderdeel. Ietwat ongebruikelijk misschien, maar hopelijk wordt dit goed ontvangen. Ik ben er zelf, uiteraard, wel blij mee. Dials (Draaiknoppen) hebben een hoge gevoeligheid als je ze horizontaal sleept. En maken juist kleinere stappen wanneer je dit verticaal doet. Toggles (Aan-/uitschakelaars) zou voor zichzelf moeten spreken. Layers (Lagen) hebben één minder voor de hand liggende gedraging. Namelijk: door een geselecteerde laag naar rechts te slepen verschijnt de “Delete Layer requester” (verwijder laag contextmenu) waarmee je de betreffende laag kunt verwijderen. De laag-panelen zelf ziet er wellicht wat vreemd uit. Misschien door de prominente knoppen die je vindt op de laag-panelen. Deze knoppen hebben altijd slechts invloed op de huidig geselecteerde laag. Nog twee minder zelf-evidente features sinds v0.98: Houdt [Shift] of [Ctrl] ingedrukt voor alternatieve functies van sommige knoppen. Bij het ingedrukt houden van [Shift] wordt “Laag naar onder/boven toevoegen” vervangen door “Laag naar onder/boven kopiëren.”. Houdt men [Ctrl] ingedrukt wordt dit “Lagen naar boven/beneden samenvoegen”. Fluidity (Vloeibaarheid) – de invloedssfeer van de vloeistof dynamiek. Is altijd actief, ook bij waarde 0. Fluid Sharpness(Scherpte) – het scherp stellen van van het vector veld. Bij 100% wordt het vector momentum niet gedistribueerd: dit geeft de scherpst mogelijke resultaten. Fluid Smudge (Smeren) – het mengen van kleuren in de vloeibeweging. Bij 100% zal de reeds aanwezige kleur de bewegende kleur domineren. Dit schept mooie smudge- (smeer) mogelijkheden. Bij 0% kun je zo'n beetje alles in je laag vervormen. Drying (Drogen) – droogt de vloeistof zodat het slechts nat wordt daar waar je schildert. Om vervolgens vrijwel direct op te drogen. De Sneltoets om Drying aan en uit te schakelen is [d]. Drying Speed (Droogsnelheid) – geeft je controle over de snelheid waarmee de verf droogt... Dat dus.. Echter ik zal waarschijnlijk de topsnelheid nog aanpassen omdat die wat onzinnig is momenteel. Smudge Chroma geeft je controle over het kleurenmenggedrag bij smudging/smeren. (mengt trouwens niet middels gemiddelde distributie of doorschijnendheid) 10% is de initiële waarde en, mijns inziens, ideaal. Maar je kunt het uiteraard ook helemaal uit zetten, 0%... of hele aparte dingen doen met 100%. Deze magische routine tracht de kleurintensiteit te behouden tijdens het mengen. En ik ben er vrijwel van overtuigd dat je dit nog niet ergens anders gezien hebt. Blending (Mengen) – activeert, en geeft je controle over, de verhouding van “kleurgemiddelden” onder je huidige penseel . Dit werk mooi samen met het smeren: de penseelstreken mengen de reeds aanwezige kleuren. Mijn persoonlijk voorkeur is zo de rond de 30%, maar het is mogelijk dat dit je computer ietwat zal vertragen. Build-up (Opbouw) – geeft je controle over de hoeveelheid materie die je aanbrengt. Vergelijkbaar met, maar onafhankelijk van, de lichtdoorlatendheid van kleur. Dit laat de inherente “verf” mechanica van Verve zien. Waarbij verf als medium/substantie totaal los fungeert van kleur (kleur: hier gebruikt als pigmentverhouding in bijvoorbeeld olieverf). Bonus bijwerking: wanneer je deze parameter helemaal op 0% zet zul je slechts daar kunnen kleuren waar reeds materie is aangebracht. Waarmee het aanwezige materiaal dus effectief als masker modus fungeert. BRI.SIZE - staat voor Bristle Size (grootte van haren). Het gaat hier over de grootte van individuele haren in een penseel . Er staan echter ook complexere penseels op het menu zonder gangbare haren. (zoals Brush #8, een fractal penseel) Bij penseels waarbij niet direct sprake is van haren tracht ik redelijkerwijs een zelfde logica toe te passen. In het geval van Brush #8 past deze waarde bijvoorbeeld de doorzichtigheid in de fractale ruis aan. Momenteel groeit de BRI.SIZE waarde ook mee met de penseel grootte. BRISTLES - staat voor Bristle Count (hoeveelheid van haren), hiermee heb je controle over de hoeveelheid haren in je huidige penseel. Ook hier geldt weer een vergelijkbare logica voor penseels zonder haren. Momenteel groeit de BRISTEL waarde ook mee met de penseel grootte. BIAS - is te beïnvloeden met een “verborgen” draaiknop op je penseel icoontje. Sleep ermee om aan te passen welke haren je gebruikt. De meeste penseels reageren trouwens op pen tilt, maar tablets die dit ondersteunen zijn nog niet heel gangbaar. Echter, ik hoop dat je er een hebt want het is behoorlijk machtig. De knopjes helemaal aan de rand van je penseel icoontje zijn voor penseel selectie: “Next” (volgende) en "Previous" (vorige). [o] om bestaande projecten te laden. [s] om je huidige project op te slaan en/of te exporteren als afbeelding (png, jpg). [Ctrl]+[s] “opslaan als...“ voor je huidige project. [Ctrl] + [Delete] om een nieuw project te starten in de huidige resolutie: met de optie om alle instellingen te herstellen naar de aanvankelijke standaard instellingen. [Shift]+[Home] past de dimensies van het venster aan naar de dimensies van het canvas. [F3] voor het in- en uitschakelen van "volledig scherm". Wat in wezen slechts een buiten beeld weggemoffeld venster is. Hoe dan ook, het geeft je absoluut een volledig scherm. Houdt [Ctrl] ingedrukt om verf uit te wissen. Dit duwt/wrijft de verf ook. Houdt [Ctrl]+[Shift] ingedrukt om geleidelijk materie te effenen. [w] aan/uit pen pressure (pendruk) voor de penseel. [e] aan/uit pen pressure (pendruk) binden aan penseel opacity (doorschijnendheid). [r] aan/uit voor penseel onscherpte, maakt alles onder je penseelbeweging minder scherp. [Alt] + [LMK] pipet om een kleuren te kiezen van je actieve laag. [Alt] + [RMK] pipet om kleuren te kiezen van de hele afbeelding onafhankelijk van de laag. [Spacebar]+[LMK] of [Ctrl]+[RMK] om de penseel grootte aan te passen. [vierkante haakjes( [ ] )] om de penseel grootte aan te passen zoals ook wel in Photoshop. Met het verschil dat hier de grootte in stappen van x2 en /2 gaat. [Spacebar]+[LMK]+[Shift] of [Ctrl]+[RMK]+[Shift] om de minimale penseel grootte aan te passen. Bij het gebruik van de tablet [w] (aan/uit) om de grootte te binden aan de drukgevoeligheid. [c] laat zien en verbergt (aan/uit) een lokaal kleurenwiel op het canvas bij de cursor. Je kunt het wiel oppakken en verplaatsen net buiten de de bovenste buitenrand (hier moet ik nog een visuele hint voor maken). [f] geeft je de fluidity dial (vloeibaarheid draaiknop) bij je cursor. [Shift]+[f] geeft je de fluidity smudge (smeren draaiknop) bij je cursor. [Ctrl]+[f] geeft je de fluidity sharpness (scherpte draaiknop) bij je cursor. [b] geeft je de materiaal build-up parameter. [Shift] + [b] schakelt tussen twee build-up waardes, die je beide kunt aanpassen. [Ctrl]+[z] undo/redo (slechts 1 undo per laag momenteel). [d] schakelt Drying (drogen) aan/uit. [pijltjestoetsen links/rechts] om vloeibaarheid aan te passen. Je kunt dit ook doen tijdens het schilderen, dat kan plezierig zijn. [-] [=] om de fluid sharpness (scherpte) aan te passen. [_] [+] om de fluid smudge. (smeren) aan te passen. [pijltjestoetsen omhoog/omlaag] om de dikte/diepte van de verf/het materiaal aan te passen. Dit werkt per laag en is uiterst handig wanneer je het eenmaal onder de knie hebt! [Ctrl]+[pijltjestoetsen omhoog/omlaag] aanpassen glossiness (spiegelende reflectie). Je kunt ook alle lagen simultaan aanpassen, relatief aan individuele instellingen, door [Ctrl]+[Shift] te gebruiken met de drie hier parameters hier boven. [Shift]+[pijltjestoetsen] om het lichtpunt te verplaatsen over de x-as en y-as. [Shift]+[page up/down] om het lichtpunt te verplaatsen over de z-as (van verder en dichter op het canvas). [L] om de kleur van het lichtpunt te veranderen naar de huidig geselecteerde kleur. [Shift]+[L] om de kleur van het sfeer-/omgevingslicht te veranderen naar de huidig geselecteerde kleur. t/m zijn de 8 verschillende experimentele penseels momenteel beschikbaar. Penseel verhoudt zich met pen-rotatie. [q] om maskeer modus aan en uit te zetten. Het maskeren werkt momenteel slechts als een voorwaarde voor vloeistoffen. Je dus kunt nog steeds schilderen in het gemarkeerde deel. [Shift] + [q] om met het alfakanaal in de huidige laag vloeistoffen te maskeren. [p] om de kleur van de achtergrond te veranderen naar de huidig geselecteerde kleur. [Shift]+[d] om “dithering” (compensatie ruis) aan en uit te schakelen. [delete] zal je afbeelding wissen!! [F5] om the schakelen tussen de verschillende spiegel modi (geen, rechter helft naar rechts, rechter helft naar links). [Shift]+[F5] legt huidige spiegel modus vast als bewerkbaar beeld. Op deze wijze kun je een symmetrisch ontwerp maken om daarna op de normale manier door te gaan. [F6] horizontaal spiegelen van het beeld (hierbij kun je er gewoon op blijven schilderen). [F7] verticaal spiegelen van het beeld (…zelfde verhaal). [Home] om Zoomen en Pannen te herstellen naar beginwaarden. [Alt]+[Shift]+[RMK] or [Alt]+[Ctrl]+[RMK] ook om Zoomen en Pannen te herstellen naar beginwaarden. [F9] creëert een nieuwe laag. [F10] ga naar vorige laag. [F11] ga naar volgende laag. [F12] in- en uitschakelen van zichtbaarheid actieve/geselecteerde laag. [Shift] + [F10] verplaatst de geselecteerde onder de vorige. [Shift] + [F11] verplaatst de geselecteerde onder de volgende. [Shift] + [F9] experimentele samenvoeging van de huidige laag en de vorige. [Shift] + [delete] om de huidige laag te verwijderen. [Shift] + [Ctrl] + [f] om de geselecteerde laag te vullen met de huidige kleur en doorschijnendheid. [Shift] + [v] om transformatie modus te activeren (momenteel slechts verplaatsen) ...om het weer uit te schakelen kun je ook alleen [v] gebruiken. [g] schakelt de zichtbaarheid van het perspectiefraster aan en uit. [Ctrl]+[g] schakelt de bewerkmogelijkheden van het perspectiefraster (aan/uit). [LMK] slepen geeft controle over de doorschijnendheid van het perspectiefraster (kan zowel positief als negatief). [Alt] + [LMK] vrije rotatie. [Alt] + [RMK] horizontale rotatie. [Alt] + [Shift] + [LMK] om de horizontale en verticale positie van het perspectiefraster over de huidige rotatie-as te slepen. [Alt] + [Ctrl] + [LMK] om de horizontale en diepte/z-as positie over de huidige rotatie-as te slepen. [Shift] + [LMK] om langs de horizontale en verticale camera-as te slepen. [Ctrl] + [LMK] om langs de horizontale en diepte/z-as camera-as te slepen. [Shift] + Muiswiel geeft controle over het vertekenen van de lens. [Ctrl] + Muiswiel geeft controle over Field Of View (Gezichtsveld). Dat is het voor nu, denk ik. Минимальные Системные Требования: ОС Windows - единственное, в чём я точно уверен; необходима поддержка OpenGL 2.1 т.к. всё основывается на GL шейдерах. Большое количество графической памяти также полезно. Может не работать на встроенных в ноутбуки картах Intel. Рекомендую видеокарты Nvidia или Ati не старее 4-х лет, как бы глупо это не звучало. Пожалуйста, дайте мне знать, если у вас возникнут какие-либо проблемы! Рекомендуется установить Драйверы| Wacom, даже если вы используете мышь. Если палитра или другие элементы интерфейса не появляются, тогда у нас проблема. Карты Ati могут дать немного другой вид (беспорядок в элементах)... ...компьютеры старше 2009 могут иметь множество различных проблем. НАКОНЕЦ начиная с версии 0.8 присутствует интерфейс, однако некоторые функции всё ещё доступны только с помощью горячих клавиш. Графический планшет, конечно, - идеальный выбор, но даже при использовании мыши всё работает довольно хорошо. В действительности сейчас нет настоящего интерфейса, только наиболее важная текстовая информация и палитра. Поэтому будьте готовы не отпускать рук от клавиатуры! Я хотел сделать интерфейс настолько ненавязчивым, насколько это возможно, поэтому отказался от беспорядка иконок и надписей. Основные элементы имеют единственную позицию и отображают важную, на текущий момент, информацию. Это, возможно, довольно необычно, и я не знаю, как это будет воспринято, но мне самому это определённо нравится. Круговая шкала: перетащите вверх или вправо для увеличения значений и влево для уменьшения. Зажмите [Ctrl] во время перетаскивания для точной настройки. Переключатели: Думаю, объяснения не нужны. Слои имеют лишь одну не слишком очевидную функцию - удаление. Выделите слой, который вы хотите скрыть или показать, зажмите и перетащите вправо, чтобы появилось Окно Удаления Слоя. Панель слоёв сама по себе может выглядеть немного смешно, потому что настройки сверху панели всегда работают только для текущего активного слоя! - копирование слоёв: Зажмите [Shift] для изменения кнопки слоя с "добавить выше/ниже" ("add above/below") на "скопировать ниже/выше" ("copy above/below"). Текучесть (Fluidity) - уровень динамичности жидкости. Активен всегда, даже при 0%. Резкость жидкости (Fluid Sharpness) - уменьшение размытости векторного поля. На 100% динамика вектора не распределяется вовсе, что делает движение жидкости максимально чётким. Смешивание жидкости (Fluid Smudge) - смешивание цветов во время движения жидкости. На 100% существующий цвет доминирует над движущимся, позволяя создавать приятные переходы. При 0% вы можете просто деформировать изображение. Скорость высыхания (Drying Speed) - управляет скоростью, с которой высыхает краска..да. Но я всегда мог настроить скорость высыхания на полную мощность, потому что сейчас она не играет большой роли. Смешивание Цветности (Smudge Chroma) - контролирует поведение смазывания (не среднего или смешивания непрозрачности). По умолчанию и идеально (по-моему) - 10%, но вы можете выключить его или сходить с ума со 100%. Это волшебная штука пытается сохранить насыщенность цветов, смешивая их особым образом. Я просто уверен, что вы ещё не видели ничего подобного! Смешивание (Blending) - включает и контролирует количество "усреднения цвета" под кистью. Замечательно работает вместе с размазыванием, т.к. смешивает мазок с уже присутствующими на холсте цветами. Предпочитаю выставлять около 30%, но это немного замедляет машину. Build-up (Накопление/наращивание) - управляет количеством материала, переносимого на холст во время рисования. Похоже на непрозрачность для цвета, но не зависит от неё. В этом выражается механика Verve, что материал для рисования (например, масло в масляной живописи) не зависит от цвета (густоты пигмента в масляной живописи). Дополнительный побочный эффект: Если этот параметр будет выставлен в 0%, вы сможете изменять только цвет уже присутствующего на холсте материала, который будет играть роль позитивной маски. Размер щетины (BRI.SIZE) - контролирует размер каждой отдельной щетинки в кистях, состоящих из них. Так я добавляю более сложные кисти, я стараюсь поддерживать эту опцию чувствительной к особенностям таких новых кистей, как Кисть#8 (кисть фрактальной бури). В ней размер щетины контролирует охват непрозрачных областей во фрактальном шуме. Сейчас это значение изменяется пропорционально размеру кисти. Количество щетинок (BRISTLES) - контролирует количество отдельных щетинок. (В кистях со щетиной).Для более комплексных кистей, как Кисть#8, пытается быть логически последовательной и таким образом изменяет фрактальный шум, что больше непрозрачных областей будет при большем значении. BIAS - "скрытая" круговая шкала на превью кисти. Перетащите, чтобы изменить, какая часть кисти (щетины) будет использоваться. Большинство кистей поддерживают наклон пера, но эта опция может не поддерживаться планшетом у многих из вас. Надеюсь, она у вас есть, ведь она крайне полезна. Маленькие кнопочки справа, на краю для выбора : "Next"(Следующей) и "Previous"(Предыдущей) кисти. [Shift]+[Tab] переключает видимость курсора кисти! Отдельно цвет и Отдельно материал (карта высот). Файлы получают суффиксы "_col"(цвет) и "_mat"(материал). [Shift] + [F2] включает Изменение Размера Холста. Нажмите [Shift]+[F2]для подтверждения изменений! Нажмите [F2] для отмены изменений! - Перетащите углы с помощью [ЛКМ] для свободного изменения области кадрирования и [ПКМ] для сохранения пропорций! - Перемещайте углы для изменения выбранных границ! - Зажмите [Alt] для изменения области кадрирования симметрично относительно центра изначального холста! - Захватите внутри области кадрирования для её перемещения! [Ctrl] + [Delete] открывает новый проект с текущим разрешением с опцией сброса всего на стандартные настройки. [F3] переключает полноэкранный режим, который является всего лишь окном без границ..., но всё же занимающим весь экран. [F4] переключает состояние окружающего холст пространства между "Clamp" (серый фон), "Repeat"(повторение рисунка на холсте) и "Mirrored Repeat" (отражённое повторение рисунка). Зажав левую кнопку мыши (LMB), вы сможете рисовать. Зажмите [Shift] чтобы просто смешивать(перемещать) краску на холсте. ( параметр fluid smudge контролирует соотношение размазывания и просто проталкивания (перемещения) краски). Зажмите [Ctrl] чтобы стирать краску. Также перемещает её часть. Зажмите [Ctrl]+[Shift] чтобы постепенно разровнять материал. [w] переключает воздействие силы нажатия на размер кисти. [квадратные скобки] чтобы изменять размер кисти как в Photoshop. За исключение того, что каждое нажатие удваивает или уменьшает в два раза размер кисти. [c] переключает отображение отдельного цветового колеса рядом с текущей позицией курсора. Вы можете передвигать его за левую верхнюю границу. [стрелки влево/вправо] изменение текучести. Можно изменять прямо во время рисования, что может быть довольно весело! [-] [=] изменение резкости жидкости. [_] [+] изменение смешивания жидкости. [стрелки вверх/вниз] изменить высоту рельефного слоя краски. Работает отдельно для каждого слоя. настройки, если дополнительно зажмёте [Ctrl]+[Shift]. ... 8 разных экспериментальных кистей доступных сейчас. Кисть  реагирует на поворот пера. [w] переключает зависимость размера кисти от силы нажатия. [e] переключает зависимость непрозрачности кисти от силы нажатия. [q] переключает режим маски. Маска ведёт себя как границы для жидкости. Вы всё ещё можете рисовать поверх этой зоны. [Shift] + [q] делает текущий альфа канал маской для жидкостей. [Ctrl] + [w] переключает режим деформирования("image warp"). В этом режими кисть изменяет только координаты на изображении. Отмена работает только вне режима деформации, переключая состояние изображения до и после неё. Сейчас нет отмены в режиме деформации, но это не разрушит ваш рисунок. - Зажмите [Ctrl] во время рисования в режиме деформации, чтобы вернуть изначальные координаты изображения в радиусе кисти. [p] изменяет цвет фона на текущий цвет. [h] переключает режим Высокого Качества (Hight Quality on/off) для супер-семплинга освещения. [Shift]+[d] переключает сглаживание (Dither on/off). [Ctrl]+[d] делает холст влажным, если включено высыхание. [Shift]+[F5] окончательно применяет зеркальный режим к изображению. Таким образом вы можете рисовать симметрично, а потом продолжить в обычном режиме. [Alt]+[Shift]+[Ctrl]+[RMB] вернуть холст в начальное положение и прекратить его вращение, если оно активно. [-] and [=] управляет скорость вращения холста. [Home] сбросить приближение, поворот и вращение холста. [Alt]+[Shift]+[RMB] or [Alt]+[Ctrl]+[RMB] также сбрасывают приближение и панораму. [Shift] + [F10] помещает текущий слой под предыдущий. [Shift] + [F11] помещает текущий слой над следующим. [Shift] + [Ctrl] + [f] залить слой выбранным цветом с текущим значением непрозрачности. [Alt] + [Shift] + [LMB] горизонтальное и вертикальное перемещение по текущей оси вращения. [Alt] + [Ctrl] + [LMB] изменить горизонтальное положение глубину по текущей оси. [Ctrl] + [LMB] передвинуть горизонтальную и ось глубины камеры. [-] [=] 调整液体锐度 fluid sharpness. [_] [+] 调整液体混合度 fluid smudge. [Shift] + [Ctrl] + [f] 以所选颜色和透明度填充当前图层. Verve (słownik: energia i entuzjazm w wyrażaniu idei, szczególnie w twórczości artystycznej lub kompozycji ...) jest wynikiem ciekawej idei, którą musiałem spróbować użyć sprzętu graficznego do uruchomienia symulacji dynamiki płynów. Idealnie jeśli używasz tabletu, oczywiście, ale nawet myszką działa całkiem dobrze. Obecnie nie ma prawdziwego interfejsu poza najważniejszymi informacjami w tekście i palecie kolorów. Dlatego przygotuj się, aby trzymać ręce na klawiaturze! Chciałem, aby interfejs tak mało rozpraszał, jak to tylko możliwe, więc byłem przeciwny bałaganowi ikon i etykiet. Zamiast tego każda główna część interfejsu ma jedną lokalizację, która wyświetla aktualnie ważne informacje. To pewnie dość niezwykłe i nie wiem, jak dobrze zostanie odebrane, ale ja - oczywiście - lubię to. Pokrętła przeciągnij w górę lub w prawo, aby zwiększyć lub w lewo lub w dół, aby zmniejszyć wartości! Przytrzymaj [Ctrl] podczas przeciągania, aby dostroić wartości! Sam panel warstwy może wydawać się nieco zabawny, ponieważ tarcze znajdujące się w górnej części panelu warstw są zawsze tylko dla aktualnie wybranej warstwy! - scalanie warstw Przytrzymaj [Ctrl], aby zmienić przycisk "dodaj powyżej / poniżej" (na slajdzie warstw, aby "scalić powyżej / poniżej" (merge above/below). - kopiowanie warstw Przytrzymaj [Shift], aby zmienić przycisk "dodaj powyżej / poniżej" na widoku warstw, aby "skopiować powyżej / poniżej". Płynność (Fluidity) - wytrzymałość dynamiki płynów. Są zawsze aktywne, nawet w wartości zerowej. Fluid Sharpness - zmniejszenie rozmycia pola wektorowego. Przy 100% pęd wektora nie jest w ogóle rozproszony, powodując, że ruch cieczy jest tak ostry, jak to tylko możliwe. Fluid Smudge - mieszanie kolorów wzdłuż płynnego ruchu. Przy 100% istniejący kolor dominuje nad ruchomym kolorem, co umożliwia bardzo przyjemne rozmazanie. Przy 0% możesz niemal całkowicie zdeformować obraz. Smudge Chroma - kontroluje mieszanie kolorów w rozmazywaniu (nie jest to mieszanie średnie lub nieprzezroczyste). 10% to domyślny i idealny (IMHO), ale możesz go wyłączyć lub oszaleć na 100%. Ta magiczna procedura próbuje zachować nasycenie kolorów, ponieważ w bardzo szczególny sposób łączy się z jednym kolorem w drugi. Jestem prawie pewien, że nigdy nie widziałeś czegoś podobnego! Mieszanie (Blending ) - włącza się i kontroluje ilość "uśredniania kolorów" pod pędzelkiem. Działa to pięknie razem z rozmazywaniem, ponieważ wtapia się w istniejące kolory na płótnie. Lubię mieć około 30% tego, ale to trochę spowalnia maszynę. że farba (jak olej w farbie olejnej, by tak rzec) jest niezależna od koloru (jak barwna gęstość pigmentu w oleju). Bonusowy efekt dodatkowy: jeśli parametr zostanie zmniejszony do 0%, kolorowany będzie tylko istniejący materiał na płótnie, dzięki czemu istniejący materiał będzie skutecznie działał jak maska dodatnia. BRI.SIZE - oznacza rozmiar włosia i odnosi się do rozmiaru każdego pojedynczego włosia w pędzlu, które mają włosie. W miarę dodawania bardziej złożonych pędzli staram się, aby parametry te były bardziej wrażliwe na funkcje takich nowych pędzli, jak pędzel nr 8 (fraktalna turbulencja). Tutaj rozmiar włosia kontroluje wielkość zasięgu napotkanych nieprzezroczystych wartości w szumie fraktalnym. Obecnie ta wartość skaluje się z rozmiarem pędzla. w rozmiarze pędzla. Obecnie ta wartość skaluje się z rozmiarem pędzla. BIAS - jest "ukrytym" numerem na miniaturce pędzla. Przeciągnij, aby wyregulować pędzle, które będą używane. Większość pędzli reaguje na przechylenie pióra (tzw. tilt), ale wielu z was może nie mieć tej funkcji na tablecie. Mam nadzieję, że to masz, ponieważ jest dość potężne! Maleńkie guziki na krawędzi służą do wyboru pędzla: pędzel "Dalej" i "Poprzedni". [Shift] + [Tab] przełącza widoczność kursora pędzla! i Tylko materiał (obraz wysokości). Nazwa pliku otrzymuje sufiks "_col" i "_mat". [Shift] + [F2] włącza Adjust Canvas Area (dopasuj obszar płótna). Naciśnij ponownie [Shift] + [F2], aby potwierdzić zmiany! Wciśnij [F2] sam, aby anulować zmiany! - Złap rogi za pomocą [LMB], aby swobodnie dostosować obszar kadrowania i [RMB] zachować proporcje! - Chwyć krawędzie, aby dostosować wybraną krawędź! - Przytrzymaj [Alt], aby wyregulować obszar kadrowania symetryczny wokół oryginalnego centrum płótna! - Złap wewnątrz obszaru uprawy, aby przesunąć cały obszar obcięcia! [F3] przełącza "tryb pełnoekranowy", który tak naprawdę jest tylko oknem wielkości pulpitu bez obramowań, ale hej ... na pewno obejmuje cały ekran. [F4] przełącza warunki brzegowe wyświetlania płótna pomiędzy "Clamp" (stos, docisk), "Repeat" i "Mirrored Repeat". Przytrzymanie lewego przycisku myszy (LMB) pozwoli ci malować na płótnie. Przytrzymaj [Ctrl], aby usunąć farbę, która również przesuwa farbę. Przytrzymaj [Ctrl] + [Shift], aby stopniowo spłaszczać materiał. [r] włącza rozmycie / wyostrzenie pędzla, rozmycie lub wyostrzenie wszystkiego pod pędzlem podczas wykonywania ruchów. Przytrzymaj [Ctrl], aby wyostrzyć. Zalecam jednak, aby w tym celu zmienić krycie na 0%! [ nawiasy ], aby dostosować rozmiar pędzla jak w Photoshopie. Z wyjątkiem tego, że podwaja się lub zmniejsza o połowę rozmiar pędzla z każdym odpowiednim trafieniem. i przesunąć lewą górną krawędzią na zewnątrz koła (nadal musisz dodać do tego gfx). [kursor w lewo / prawo] wyreguluj płynność. Możesz to zmienić podczas malowania, co może być dobrą zabawą! [-] [=] wyreguluj ostrość płynów. [_] [+] wyreguluj smużenie płynów. [kursor w górę / w dół] reguluje wysokość wypukłości farby. To jest na warstwę i przyda się, gdy ją poznasz! Możesz wykonać ponad wszystkie korekty wszystkich warstw, w stosunku do ich ustawień, używając [Ctrl] + [Shift] na powyższych trzech parametrach. [Shift] + [klawisze kursora] przesuń źródło światła wzdłuż osi X i Y. ...  obecnie dostępnych jest 8 różnych pędzli eksperymentalnych. [q] włącza malowanie maski. Maska działa obecnie jako stan graniczny dla płynów. Nadal można malować na tym obszarze. [Shift] + [q] ustawia bieżącą warstwę alfa jako maskę dla płynów. [Ctrl] + [w] włącza tryb "odkształcenia obrazu" (warp image). W tym trybie pędzel wypacza tylko współrzędne obrazu. Cofnij (Undo) działa tylko poza trybem odkształcania, przełączając się między obrazem przed i po odkształceniu. Obecnie nie ma cofania w trybie odkształcenia, ale to nie zniszczy twojego obrazu! - przytrzymaj [Ctrl] podczas malowania w trybie odkształcenia, aby przywrócić oryginalne współrzędne obrazu wewnątrz promienia pędzla! [Ctrl] + [Shift] + [w] spowoduje ponowne zastosowanie ostatnio używanego odkształcenia. W ten sposób możesz zastosować tę samą warpę do innych warstw lub zabawić się ponownie kilka razy tym samą odkształcenie (warp), hehe. [Ctrl] + [d] powoduje, że całe płótno jest mokre, jeśli suszenie (drying) jest włączone. [Shift] + [F5] zatwierdza tryb lustra, zapisując go na obrazie. W ten sposób możesz zaprojektować symetrię, ale kontynuować normalnie. [Alt] + [Shift] + [Ctrl] + [RMB] resetuje rotację płótna i zatrzymuje "wirowanie", jeśli jest aktywne. [-] i [=] kontrolują prędkość obracania płótna. [Shift] + [Ctrl] + [f] aby wypełnić bieżącą warstwę wybranym kolorem w aktualnie wybranym kryciu (opacity). To jest wersja laboratoryjna, pełna dziwnych małych eksperymentów i elementów interfejsu w każdym miejscu, ale ... do cholery ... jest Święta Bożego Narodzenia i jest w nim mnóstwo prezentów! Absolute: W tym trybie farba nie będzie kumulować się na płótnie, ale tylko wzrośnie do wybranej ilości narastania. Jest idealny do szkicowania. Accumulative (Akumulator): Jest to oryginalny tryb malowania, gromadzący materiał na płótnie, tak jak zawsze. Idealny do malowania. Additive (Dodatek): te tryby dodają wartości koloru do istniejącego koloru, np. Dodając światło, w pewnym sensie, tworząc w końcu poświatę. Na wierzchu znajduje się również nowy parametr do interaktywnego efektu świecącego. To zabawne. To jest dobre dla ... ehm ... zabawy. I wszystkie rzeczy są lekkie! Obecnie obrazy pędzla są po prostu eksperymentalne i działają z pędzlem nr 9 i nr 0. Obrazy pędzla są jak ramki animacji. Możesz dodawać obrazy i będą one odtwarzane podczas malowania. Nie ma dla nich jeszcze zarządzania, ale możesz już zapisywać i ładować sekwencje obrazów pędzla! Prosimy o cierpliwość i ostrożność podczas używania skrótów klawiszowych, nie dlatego, że jest z tym jakiś problem, ale dlatego, że jest trochę dziwnie. Nie ma żadnych wskaźników dotyczących trybów ani innych rzeczy, których należałoby się spodziewać, a więc wszystko to jest bardzo, bardzo "garażowe" lub "laboratoryjne" ... ale nadal przyjemne, hehe, możesz zobaczyć !? [i], aby dodać nowy obraz pędzla i włączyć edycję pędzla. Otwiera mały selektor prostokątny. Więcej o tym jeszcze niżej! [Ctrl] + [Shift] + [i] przełącza tryb kolorów, używając oryginalnych kolorów obrazów, zabarwionych według bieżącego koloru lub używających tylko bieżącego koloru, ignorując kolory obrazu. [j] włącza / wyłącza transformację perspektywy, przybliżając perspektywę obrazu wykonanego zgodnie z sugestią prostokąta selektora. w środku pędzla i maluje cały obraz zabarwiony tym kolorem! Pędzel # 9 z obrazami ... cóż, zobaczysz, to tylko pomaluje obraz rozłożony na włosiu (szalona zabawa, jeśli wiesz co robisz!). Pędzel nr 0 działa tylko z obrazami. Jeśli nie ma obrazu, nie będzie niczego rysować !!! Małe pokrętła interfejsu pędzla zrobią bardzo konkretne rzeczy na tym pędzlu. Idź odkrywać, hehe! Wyjaśnię więcej później, obiecuję! Tryb maskowania w rzeczywistości maskuje obraz. [q] włącza aktywny status maski bez zmiany maski. [shift] + [q] podnosi farbę obecnej warstwy jako maskę. [kliknij prawym przyciskiem] W CENTRUM, aby zmienić swój Quad w kwadrat. Oblicza to średnią wielkość na podstawie wszystkich krawędzi, zobaczysz! [prawy przycisk myszy] NA KRAWĘDZI (a nie na rogu) zamrozi ramkę, aby można było bez problemu nad nią malować. To jest fajne, gdy chcesz zrobić animację lub animowany postęp pędzla. Muszę zrobić dla tego trochę wideo na youtube! [prawy przycisk myszy] NA KRAWĘDZI znowu i ponownie odblokujesz Quad. Możesz zrobić sekwencję obrazów do użycia jako obraz pędzla, skutecznie tworząc animację. (pr) użyje nacisku pisaka do wybrania obrazu z sekwencji, zaczynając od najniższego z lewej strony do najwyższego nacisku na ostatni obraz. (rn) użyje losowych obrazów z twojej sekwencji. - Zachowaj Selector Quad tam, gdzie jest na razie! - naciśnij ponownie [i], co spowoduje zapisanie obrazu! - naciśnij ponownie [i], aby dodać nowy obraz! - Zrób kilka kropek wokół centrum! - utwórz kilka kropek i uczyń jego środek nieco gęstszym! - dodawaj coraz więcej rzeczy i rób to jeszcze dla kilku obrazków więcej! a następnie wybierz Brush # 9. Jeśli masz nacisk na pióro, zobaczysz, że animuje obrazy zgodnie z naciskiem pióra. TO NIE DZIAŁA Z MYSZĄ ! Ten pędzel maluje jak pędzel nr 1, nie używając szczeciny, ale użyje obrazów zamiast kropli. Maluje je w odstępach czasu, gdy wykonujesz obrys farby. Szybkość, z jaką to się dzieje, opiera się na małym pokrętle o nazwie "Bristles" tuż obok obrazu podglądu na GUI pędzla. Obok znajduje się mniejsza tarcza o nazwie "Osc.Chaos". Maksymalnie 50% spowoduje losowe obracanie obrazów podczas malowania. Jednak przejdź powyżej 50% i zacznie zrównoważyć obrazy, aż do pewnego maksymalnego rozprzestrzeniania (bardzo chaotyczny!). Nad tarczą "Osc.Chaos" znajduje się pokrętło "Oscylator", które po prostu obraca obraz w prawo o ponad 50% i przeciwnie do ruchu wskazówek zegara poniżej 50%. Obok tego tarczy "Bri.Size", która naprawdę losowo zmienia wielkości obrazu z każdym pociągnięciem. Opanuj te kilka parametrów i uzyskaj całkiem interesującą różnorodność efektów! Mogę ci prawie obiecać, że zrobi to dziwacznie, ale mogę ci też obiecać, że to też zadziała pięknie. Napotkałem tylko kilka dziwnych rzeczy, które muszę jeszcze wymyślić, na przykład sporadyczne przeskakiwanie uchwytów na histogramie i możesz obserwować niektóre wycinki, jeśli zdecydujesz się na ekstremalne ściskanie "krzywej rączki". Zakładam, że większość z nich jest dość oczywista, z wyjątkiem prawdopodobnie uchwytów na histogramie. Masz 5 uchwytów. Pierwsze i ostatnie są najbardziej oczywiste. Dzięki nim możesz przenosić najciemniejsze kolory i najjaśniejsze kolory tam, gdzie chcesz je mieć. Możesz nawet odwrócić je ręcznie. Środkowy uchwyt umożliwia przesunięcie wartości środkowej dookoła. Ale są też dwa magiczne uchwyty wokół środkowego uchwytu. Są to uchwyty stronniczości. Górna i dolna połowa histogramu mogą być niezależnie odchylane, co pozwala wykonywać operacje podobne do krzywych, aby kontrolować kontrast dla każdego kanału. Poza kanałami jasności i wszystkich kolorów masz również kanał materiałowy. Ten jest najstraszniejszy ze wszystkich i ignoruje pokrętło mieszania! Pozwala modyfikować tworzenie się farby na warstwie, umożliwiając fascynujące rzeczy! Kolejna szybka aktualizacja ... jeszcze żadna zmiana numeru wersji! Dodałem TINT i + LAYERS do GUI LayerFX. TINT pozwala na odcień wszystkich kolorów w kierunku aktualnie wybranego koloru. +LAYERS (WARSTWA) zastosuje korektę kolorów do wszystkich warstw. Nie będzie jednak stosować istotnych zmian we wszystkich warstwach. To na razie trudniejsze. REPLACE, które mogłeś już napotkać. Pozwala zmieniać kolory w oparciu o maskę wokół aktualnie wybranego koloru. Im wyższa wartość, tym bardziej zaznaczony jest wybór wokół aktualnie wybranego koloru. Może być denerwujące, że zarówno TINT jak i REPLACE używają aktualnie wybranego koloru. Później mogę dodać sposoby indywidualnego wybierania kolorów. Ale teraz jest całkiem przyjemnie mieć takie bezpośrednie działanie.